Many people aren’t sure about what cloud computing actually is, yet it already plays a large role in our personal and working lives. If you have a gmail address, your email is hosted in the cloud; if you bank online and participate in social media you’re computing in the cloud. Cloud computing is, in short, the delivery of computer hardware and software via the Internet. It’s an extremely useful resource, especially for businesses, because it provides access to services that you either wouldn’t be able to afford or have space for in your office. 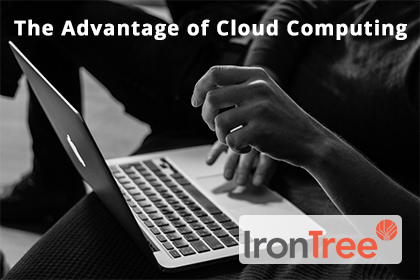 With cloud computing you can scale your services up or down to meet fluctuating workloads and do away with the fixed costs of infrastructure. You can also tailor your applications to suit your needs and only use what’s necessary to your business. The cloud enables you to synchronise your devices and programmes and work effectively from a virtual office at any time. Programmes, applications and data in the cloud are accessible from any device connected to the Internet. You only pay for the resources you use and there are no outlays in terms of hardware, infrastructure and staff to run and maintain them. Costs for cloud-based services are also fixed according to what you’ve chosen. Hardware failure doesn’t mean loss of data because the data is securely stored, off site, in the cloud. And selling via the cloud means your products and services can quickly be available to the global market. Programmes hosted in the cloud use the most innovative technology available so you never have to wonder if it’s time to upgrade – you’ll automatically be kept up to date with the latest. You can also collaborate with people around the world when your resources are hosted in the globally accessible cloud. And while cloud service providers manage your infrastructure, you can focus on your core business. For a business to have an email server, there needs to be a room dedicated to that server and someone to operate it. This is costly to run, maintain and update with security protection, and the space could rather be used as an extra work station. With cloud technology your email system can be hosted on a remote server and maintained by a provider that delivers your email service over the Internet. It’s then the responsibility of this provider to maintain the server, keep anti-virus and software up to date and deliver your emails 24/7. This type of service is called “hosted exchange” and means that your emails are safe from viruses, spam and ransomware; your emails are synchronised and updated to all your devices at all the times; and you can expand or scale down as you choose while only paying for what you use. Another example of how cloud computing can make a substantial difference to the functioning of your business is online backup. Backing up your data daily is the only way to protect your files from ransomware, loss, theft, corruption and other disasters. Backup using cloud computing is an automated system of frequent data backup between your computer network and a secure data centre. The system is failsafe as your files are encrypted before they leave your computer network and are transferred to the data centre via the Internet with no human intervention.